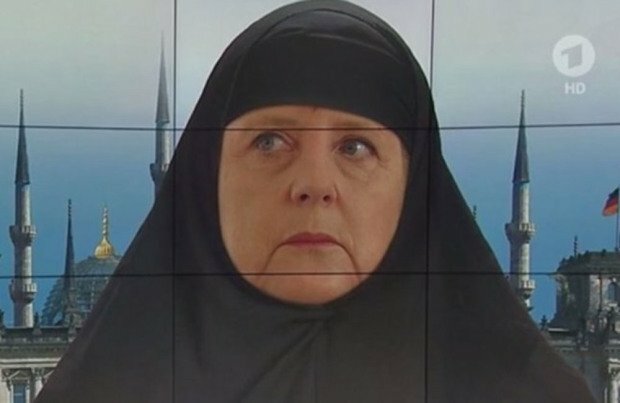 German TV station ARD has come under fire after airing a mocked-up image of Chancellor Angela Merkel wearing Islamic headscarf. ARD has denied broadcasting “anti-Islamic propaganda”. The image was shown in the background of a segment on refugee quotas in the channel’s Report from Berlin program. The program has received heavy criticism from viewers, some of whom said the image resembled those used by anti-Islam movement PEGIDA. ARD said that the image was “designed to capture people’s attention”. “We welcome the many criticisms of the graphic in yesterday’s Report from Berlin and we are sorry some disagreed with our portrayal of the chancellor or even misunderstood,” the program said in a statement published on Facebook. The statement said the graphic was intended as satire and reflected “the achievements of our Western society – freedom of expression, press freedom and equality”. However, viewers took to Facebook to accuse the channel of anti-Islamic propaganda, calling the report “manipulative” and “appalling”. “This is not constructive journalism,” wrote another. Some defended the report, saying the program was entitled to freedom of expression and had asked “very reasonable questions”. Many viewers compared the image to placards used by the Germany anti-immigrant protest group PEGIDA – which stands for Patriotic Europeans against the Islamification of the West. The group attracted tens of thousands to protest marches in cities around Germany earlier this year, with some waving placards displaying Angela Merkel wearing a headscarf. PEGIDA’s protests have seen a resurgence in numbers recently after infighting led to cancellations and a dip in attendance. On October 3, several thousand people attended protests in two towns – Plauen and Sebnitz – after a call to action by the group. The ARD controversy comes at a time of heightened tension over immigration in Germany, which has said it is expecting 800,000 refugees and migrants to enter the country by the end of 2015. However, a report leaked to German media suggests officials have put the figure far higher – at about 1.5 million. Angela Merkel has come under growing pressure within Germany to clarify official estimates and defend her open-door policy towards refugees.